The calendar says it’s Spring. and the last few days highs near 90. Welcome to Spring in Texas. and put on new ones. The Snapdragons are finally starting to bloom. Almost too late. I’m thinking they prefer cooler weather. My neighbor, Ellie’s Viburnum is blooming. trimmed back. Now I’m glad I didn’t. It’ll have to be done though, after the bloom is over. There are little fruits, on the Elaeagnus. We’ve seldom seen these, even though we notice the tiny blooms. The white Cemetery Iris has been blooming a lot. There are buds on other colors. All Pass-Alongs. The ones I bought, have not done well for the second year now. Inland Sea Oats are spreading, just as I wanted. The ones all over the rest of the yard, were not exactly my wishes. I’ll be moving them around. The deer don’t bother them. That makes them a favorite plant. There are supposed to be berries to follow. I’ve never seen them here. Maybe something gets them before I see them. Again in the Deer Grove, these yuccas are colonizing very nicely. I think they’re Twisted Leaf. I’m thinking of trying to move a couple to the house. It would be nice for them to take up some room in a flower bed. No care...and, deer don’t touch them. Of course, the weeds keep coming. This will be fun to clean out. I tried a little. Ouch! It’ll take tools and gloves. I use some kitchen tongs. They usually work. And, lots more weeds and clean up to come. But, evenings find us sitting on the porch. A glass of wine, and conversation. And, catching a little light in a bottle. I love your comments. Thanks for dropping by. This is a word verification free blog. It seems to be working out, so far. 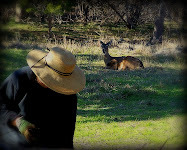 Welcome to this patchwork of gardens, birds, and critters....friends and family....among the deer and limestone. Chasing squirrels is hard work. First day of fall - let's plant! All photos and text on this blog are the sole property of Patchwork Garden. Any use or reproduction, without permission, is prohibited.